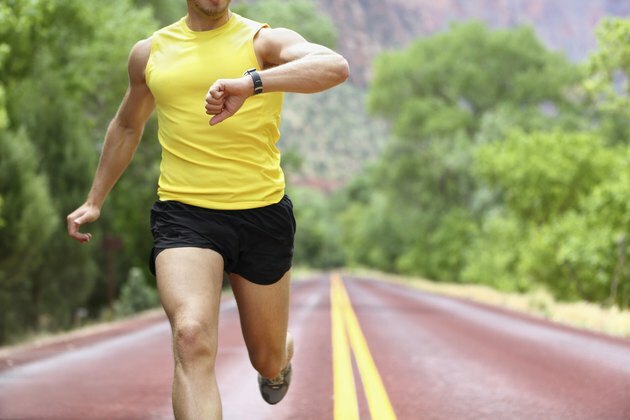 A 9-minute mile has you moving at about 6.7 mph. At this pace you'll cover a 5K in a respectable 27 minutes, 54 seconds, or a half-marathon in a few seconds over 1 hour, 57 minutes. You'll also burn 11 calories or more per minute, depending on your size. A 125-pound person burns about 330 calories running a 9-minute mile for 30 minutes. If you weigh 155, you'll burn about 405 calories in the same amount of time. At 185 pounds, you'll sizzle 488 calories. If you weigh more, your calorie burn is higher, and if you weigh less, your burn isn't as high. It takes more energy to run a bigger engine -- which is why the more you weigh, the more energy you use. How Many Calories Are Burned by Bicycling Eight Miles in an Hour?